Play is crucial to a child's development. There are over 200 parks and playgrounds in the Greater Baton Rouge area. None of these are designed specifically for special needs children. Approximately 20,000 children in Livingston, East Baton Rouge, West Baton Rouge, Ascension and St. Helena are physically, mentally or developmentally challenged. For these children, play is a limitation. NO RESERVATIONS ARE BEING TAKEN~ IT IS ON A FIRST COME BASIS! Kidz Korner Playland Project is a collaborative endeavor between the Pilot Club of Denham Springs Foundation and the City of Denham Springs to build an ADA approved playground for the children of Livingston Parish and surrounding area to play without limitations set on their physical, mental or developmental abilities. At the time of it's build (October 2010), Kidz Korner Playland was only 1 of only 4 playgrounds in the state of Louisiana designed specifically for children with different abilities. The playground is located at the corner of River Road and Government Street, 979 Government Street. It all started in 1997 when the Pilot Club of Denham Springs sponsored a handicapped softball team through the local parks and recreation program. The program was limited because there were no special facilities or accommodations for the kids participating in the program. Realizing the importance of play in socialization, the Pilot Club formed the Pilot Club of Denham Springs Foundation to raise funds to build a playground where children of all abilities can play together. 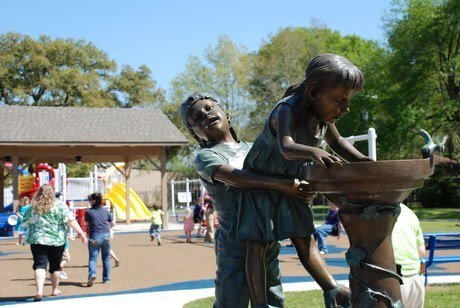 The City of Denham Springs designated land for the purpose of this playground, pledging support to maintain the facilities, as well as fund the infrastructure anda ADA approved bathroom facilities. Local business owners, schools, and the general public have generously donated engineering and architectural work, construction and materials for a pavillion and landscaping.